Flat roofs are common on commercial buildings, and present a unique set of problems and challenges to remain intact and effective at keeping out the elements. Live Oak Construction is the commercial roofing contractors Houston who best understand the special requirements of flat roof construction and flat roof repair Houston. We use the latest flat roof technology to help ensure the integrity and durability of your commercial flat roof. PVC (polyvinyl chloride) roofing systems consist of a flexible membrane that provides excellent wear, high strength and resistance to sunlight and chemicals. A PVC roof withstand heat, wind, rain and a wide range of temperatures. Seams linking individual membrane panels can be sealed to be as impervious as the membrane itself. PVC roofs offer the lowest lifecycle cost and enhanced energy savings due to their reflective qualities; and have an expected life of 30-plus years. EPDM (ethylene propylene diene monomer) is a rubber-like black membrane that is usually adhered directly to the roof deck. EPDM roofs perform well in a wide range of temperature and weather conditions. An EPDM roof is an inexpensive solution for a durable, weather-resistant flat roof, and is particularly suitable for commercial applications. Also known as modified bitumen, torchdown involves using a flame to melt bitumen (asphalt) sheets onto a fiberglass base sheet. A torchdown roof resists any weather and provides good insulation. 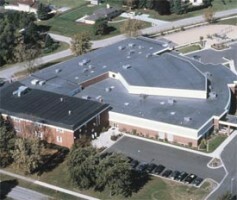 This roofing method is extremely low-maintenance, due to the combination of asphalt with synthetic rubberized polymers. A torchdown roof can often be installed over an existing flat roof. Hot tar roofing is also called built-up roofing. Several alternating layers of rolled out fiberglass based materials and molten tar are laid down to create a durable covering that provides good weather resistance and a long life. The multiple layers provide additional protection against water entering your building. Our flat roofs also repel the harsh UV rays of the Houston sun. This is crucial if your company has a product that needs to be climate controlled. Live Oak Construction employs expert Houston commercial roofing contractors with more than 24 years of experience designing and installing flat roofing systems, making us your best choice for flat roof installation.